The $25,500 buy-in event at the Seminole Hard Rock Poker Showdown saw the big guns firing once again, just as they were in the $3,500 and $10,000 final tables earlier today. 116 players stepped up to the plate for this event, creating a prize pool of $2,900,000. 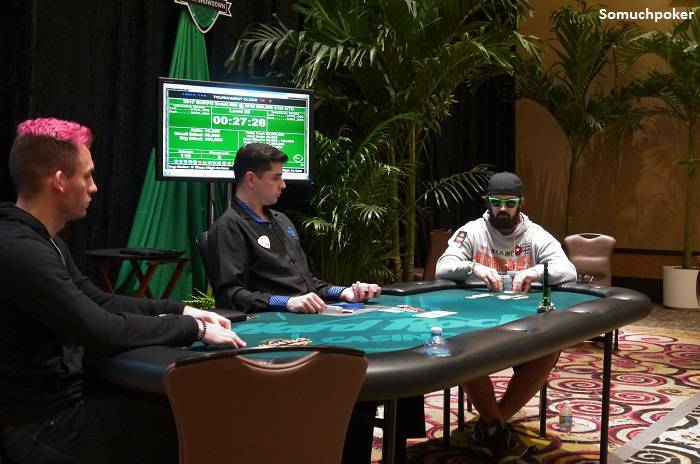 The final figure set aside for eventual winner, Jason Mercier was $794,600. Erik Seidel had a chance to take a big step towards overhauling Daniel Negreanu in the all-time money race today, but fell short, only managing a top 20 finish. With the final table drawing near, Brynn Kenney, Jason Mercier, Loni Harwood and Justin Bonomo were all still in the mix, with Jeff Gross busting out in 9th place. That elimination convened our final table, as the final 8 pulled up their chairs to fight it out for almost $800,000. The final table started in explosive fashion, with a double bust-out quite early in proceedings. Ari Engel and Bryn Kenney were both put to the sword by Jason Mercier when his held up against and . Next in line to gain some traction was Loni Harwood. She managed to get the best of a flip against Sam Soverel in dramatic fashion, as his flopped set of tens was dismantled by the arrival of a back-door flush. Having led the chip counts a little earlier, Soverel was finished off by Justin Bonomo’s in a hand which saw both move all-in preflop. Bonomo heavily outdrew the of his opponent on a flop, spelling the end of Soverel. With five players remaining, Bonomo had constructed a 4,775,000 stack, giving him a comfortable lead over Jason Mercier, who occupied 2nd spot with 2,600,000. Mercier was once more hoovering up the chips as the list of survivors shrank to four. Olivier Busquet was the victim of an unfortunate cooler as he 3-bet shoved , only to walk into the waiting clutches of Mercier’s . This pot helped push him up alongside chip-leader Bonomo, who fell back a little shortly afterwards when he lost a flip to short stack Anthony Spinella. The joy of Spinella was short-lived however, as he would fall in 4th place in the following few hands. This time it was Bonomo doing the hoovering, as he reclaimed his comfortable chip-lead with a fairly sweatless pocket pair against smaller pair situation. Loni Harwood was next to fall, and it couldn’t have been more dramatic, as her shove was met by another shove from Jason Mercier. Chip-leader Justin Bonomo must have thought this event had his name written on it as he quickly called and flipped over , but somehow, Mercier’s tens found salvation on the river as the miracle two-outer got there. Mercier more than doubled up, and the scene was set for the final duel. After a short break, the battle got underway with the chip counts finely poised. Mercier held 6,410,000 to Bonomo’s 5,190,000 and the title could easily have gone either way as the two pros squared off against each other. After a few early tentative exchanges, Mercier gradually began to pull away. From that point, he never looked like letting it slip, and after his open with was met by the 3-bet shove of Bonomo with , it was all over. Jason Mercier wins this event for $794,600.